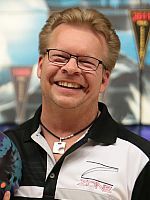 Finnish standout Kimmo Lehtonen won his second consecutive qualifying squad Sunday at Tali Bowling Center in Helsinki, Finland, to take the pole position in the Brunswick Ballmaster Open with 1443 total and an average of 240.50 for six games. 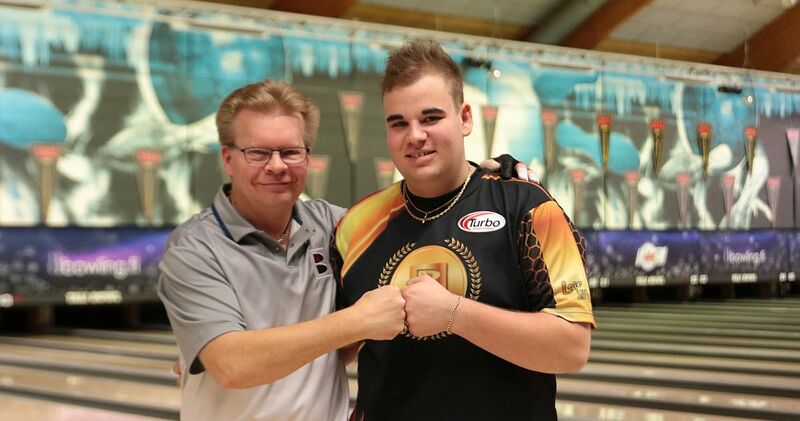 The lefty (pictured above with Niko Oksanen, right), who has won the Ballmaster in 2002 and 2007, will celebrate his 50th birthday in March and was eligible to bowl in his first career “senior squad” on Sunday morning. After leading squad 4 on Saturday with 1354, Lehtonen rolled games of 224, 279, 193, 268, 267 and 212 in squad 5 to become the second player in the 48th edition who surpassed the 1400-mark. Squad 1 leader and three-time Ballmaster champion Pasi Uotila (left; 2000, ’04 & ’09) slipped to second place with 1407. 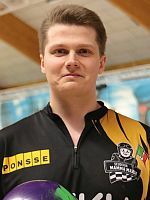 19-year-old rising star Niko Oksanen missed the 1400-mark by just two pins to fall to third place with 1398, including five games between 268 and 226 and a low game of 186. Past world champion Mika Luoto (right) and 15-year-old Pyry Puharinen fell one spot to fourth and fifth place with 1379 and 1377 total, respectively. Kari Hurri (left) was third in squad 5 with 1361, including six games between 246 and 204, and jumped into sixth place in the overall standings. Ani Juntunen, remained the best woman in the field but fell to 16th place with 1316 total, including 8 pins handicap each game, a standard for women on the European Bowling Tour. Squad 6 on Sunday afternoon offered extra prizes for the top veteran bowlers age 60 and over. Simo Leskinen (right) led the squad with 1335 total, including games of 218, 234, 234, 203, 235 and 211, an average of 222.50, to move into 11th place. Pekka Lindholm (left, with Kai Virtanen, left) was close behind and the only other player who surpassed the 1300-mark with 1332, good for 12 place overall. 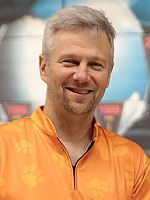 As the top veteran, Lindholm received a Brunswick bowling ball from tournament organizer Kai Virtanen, a former Finnish national team member and past World Games champion. Another two full squads (72 players each) on the third day of qualifying brought the number of participants to 333 players, including 292 men and 41 women, 319 from Finland and 14 from Estonia, Germany, Latvia, Russia and Sweden. 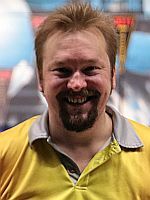 Emil Strömberg, all from Finland, currently holds the 40th and last place to advance with 1236 or an average of 206. Qualifying takes a two-day break and commences Wednesday, January 10 with squads 7 & 8 scheduled to start at 11 a.m. and 3 p.m. Eastern European Time (EET). Photos courtesy of Seija Lankinen. 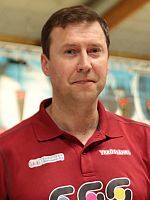 The 48th Brunswick Ballmaster Open will be held from January 5-14 at 36-lane Tali Bowling Center in Helsinki, the capital and largest city of Finland. Other than last year, when the BBO was a “platinum” level tournament, the 48th edition of the prestigious event is one of two “gold” events this season, the second highest of five EBT categories (satellite, bronze, silver, gold and platinum). The BBO offers total prize money of 83.700 Euro, including all extra prizes, with 10.000 Euro going to the winner, 6.000 Euro to the runner-up and 4.000 Euro apiece to the third and fourth place finishers. Low to cash is 48th place, worth 800 Euro. The tournament offers 3.000 Euro for the first 300 game, or for the highest game if there will be no 300 game. Qualifying (six games, unlimited re-entries) begins Friday, Jan. 5, with squads 1 & 2 and concludes Saturday, Jan. 13, with squad 16 followed by the ultimate one-game Desperado Squad slated for 7 p.m. Eastern European Time (EET). Total 48 players, including the top 40 from the overall qualifying standings, the top 2 from a separate leaderboard of squads 9-10 and the top 3 of squads 1-8, who are not among the top 40 plus the top 3 from the Desperado Squad, qualify for the finals. The top 12 qualifiers receive a first-round bye. The other 36 finalists bowl six games starting from scratch with the top 24 advancing to the second round. Those 24 join the top 12 qualifiers to bowl eight games starting from scratch. The top 16 players will be seeded into two groups according to their positions: Group A (1, 4, 5, 8, 9, 12, 13 and 16) and Group B (2, 3, 6, 7, 10, 11, 14 and 15). Round 2 pins carry over. The group phase features seven games of round robin match play (no position round). During match play, players receive 30 bonus pins for winning a match and 15 pins each in the event of a tie. The 15-game totals, including all bonus pins, will determine the top two players in each group who advance to the semi-finals (B1 vs. A2 and A1 vs. B2). The semi-final winners will bowl for the title (all one-game head-to-head matches). Top 40 from the overall qualifying standings, the top 2 from a separate leaderboard of squads 9-10 and the top 3 of squads 1-8, plus the top 3 from the Desperado Squad will advance to the finals. The top 12 qualifiers will receive a first-round bye.